Panorama forms operate in two distinct modes – data access mode and graphic design mode. Data access mode (also called “data mode”) is the default mode. In this mode you can view and display data, and navigate through the database. Graphic design mode (also called graphics mode) functions like an electronic drafting table. 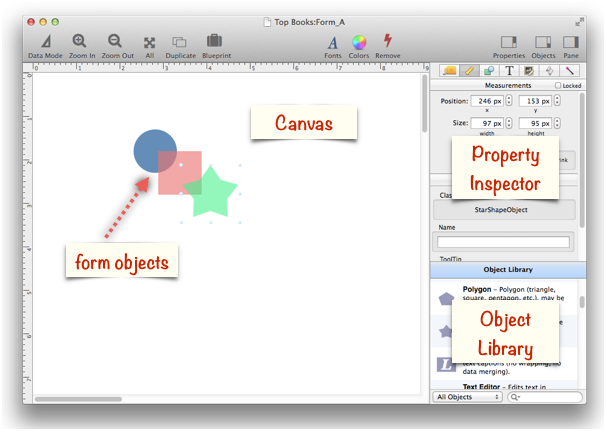 In this mode you design the form by drawing lines, boxes, and other graphic elements. This mode is very similar to many drawing and page layout programs. Graphic design mode is easily recognized by the rulers that appear at the top and left edges of the window, and the inspection palette that appears on the right side of the window. To switch between data access and graphic design modes, click on the leftmost tool in the tool palette. 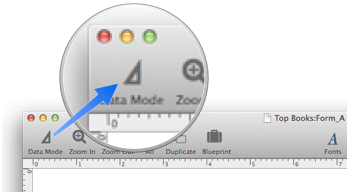 Each click on this tool toggles the window between the two modes. adjustobjectspacing -- The adjustobjectspacing statement adjusts the spacing of selected objects in a form. adjustobjectspacingdialog -- The adjustobjectspacingdialog statement opens a dialog sheet to adjust the spacing of the currently selected objects. Graphics Mode -- is used to edit the graphic design of a form. Polygon Object -- draws a polygon within a form. Rich Text -- is used to display styled text, including bold, italic, colors, tabs, even images. 10.0 No Change Carried over from Panorama 6.0.